I have heard a lot of people saying, over the past year or so, that they are spending more time and energy on their social media campaigns and less time on their websites. Case in point: several of my colleagues are using Facebook Business Pages as opposed to websites these days. So, the question is: Are social media displacing the traditional website we’ve all come to know and love? In our Social Networking workshop, we advocate the use of social media in conjunction with what is already working for your business. If you have a dynamite website set up for your business and it’s serving you well, why scrap it? Your website stands for constancy and familiarity with your existing clients and it’s a great testament to what it is that you do, for prospective clients. Plus, you can never have enough of an online presence if you want to maximize your SEO (search engine optimization). But, what we definitely recommend is that no business be without a social media presence in today’s market. That would just be counter-productive, especially given the ease with which social media can be used. A social media campaign is absolutely essential to the success of a business’ growth right now. The fact is, people are on social media sites like Facebook on a daily basis. Facebook has become a primary source of information for a lot of us. And, with Facebook’s user numbers expecting to shoot upwards of a billion before this year is up, if your business isn’t on Facebook, you stand to be in a position where you will not be as easily found when people are seeking information about the very products and services that you provide. The same goes for other social media platforms. Each has its own special features that make it unique and essential from a business perspective. I’ve discussed them all in detail throughout some of my other posts: Twitter is great for getting short bursts of information out there in real time – updates, event information, links, etc. Blogs are a wonderful way to position yourself as an expert in your industry – to share valuable information and your knowledge with people. LinkedIn is the place to connect with like-minded business individuals and to network within a comprehensive business arena. So, what are some of the fundamental differences between social media platforms and a website in terms of your business? First and foremost, social media are just that – social. A social media site is not a platform for overt advertising and hard-sell tactics. Social media sites exist to help you connect with people – to inform and enlighten – to engage in two-way dialogue with clients and prospects. A website, on the other hand, is a place where you can more aggressively peddle your wares, so to speak. A website is static – updated and changed, for the most part, on a not-so-regular basis. Social media business sites can be easily updated and altered on a daily basis, whenever necessary, in real time. That’s important for any business. Social media sites also provide you with an opportunity to take part in ‘live’ conversations with people through messaging and groups features. 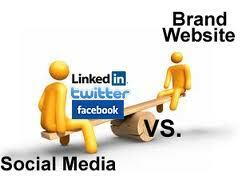 Bottom line, a social media presence is a necessity for your business in the current market. Websites are still important, too. And, no, it’s not redundant to incorporate both a social media presence and a website into your business’ marketing strategy. It’s important, in fact, that the two co-exist and even feed off of each other to allow for maximized SEO and a well-structured presence on the web. This entry was posted in Blogs, Facebook, LinkedIn, Real Estate, Social Networking, Traffic, Twitter and tagged social media vs. traditional website, social media vs. website. Bookmark the permalink.